We have our moments of contention.At times, he seems to be sluggish and distantly separate when I have forgotten him for awhile…he likes to be stirred up, and only I can do that. He spat at me once, in one long, sour stream that hit me mid-chest. I chalked it up to my father’s recent departure, figuring some otherworldly tobacco-chewing version of my dad was channeling Petrie from the spirit world (OK, you can check out now if you think I’m too weird). But, mostly, Petrie and I are fine. We get together every couple of weeks (if not sooner), “dish” a little and up with something pretty good. It’s a necessary part of our relationship. Sometimes it might seem I demand too much of Petrie, but actually, I think could expect even more. 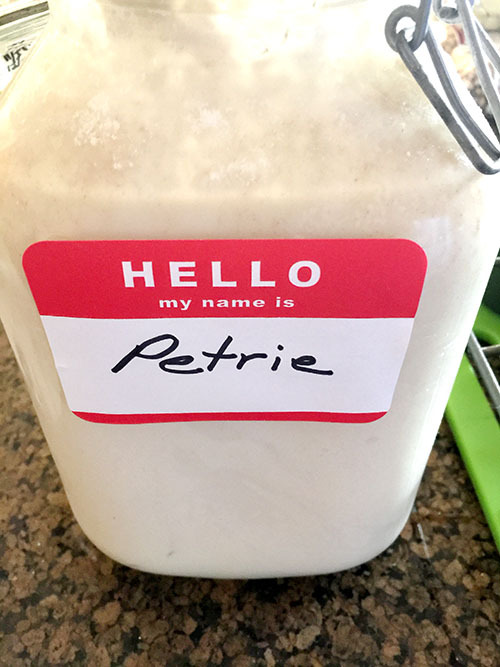 If you don’t know, Petrie is my sourdough starter, an offspring of Spike, my baking maven friend, Elaine’s starter charge, whom I “watched” during a summer three years ago. Given these starter boys are living things, they not only deserve names but quite a lot of respect for their resilient survival and all that they give. My Petrie has taken me not only on loaf bread-baking adventures, but regular forays into biscuits (which lead to breadsticks), cinnamon rolls, pancakes, waffles and, to my most recent delightful surprise (as it is one of my favorite breads) — popovers. Popovers, those true wonder breads, are a thing of sheer magic. A very thin, egg-y batter is poured into a scorching preheated muffin or popover tin, baked in an extra-hot oven, and in the course of its time in the heat, bursts into whirling waterspouts of dough, ending in puffy-light, crusty hollows of goodness. They are supreme! 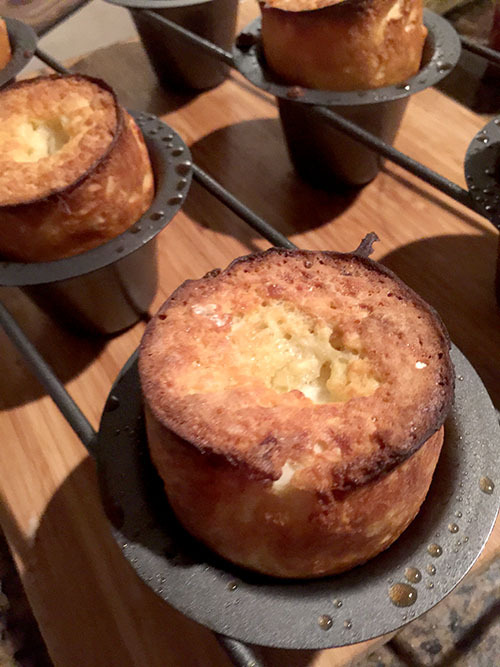 One of my most dreamy restaurant evenings was my first experience at the Wayfare Tavern in San Francisco, where you are handed a basket of piping-hot, herb-y popovers the minute you are seated. What a treat! I have not often made popovers, but having done so at least once, I, of course, own a popover pan. It needed to be used again. I needed more popovers in my life. To the rescue…Petrie. 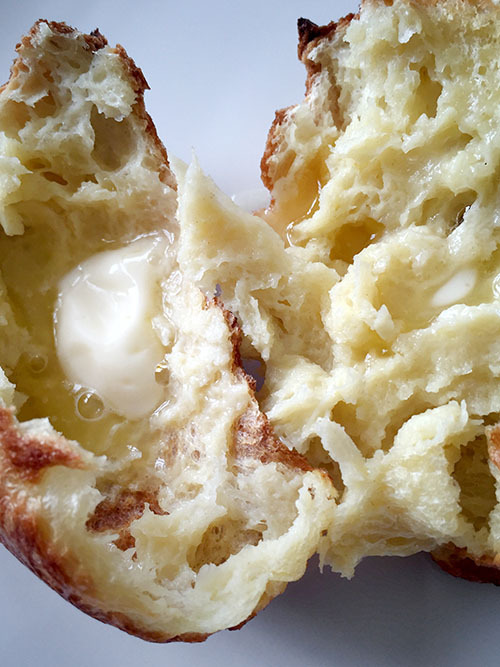 Turns out, sourdough starter has endless magic up its sleeves, including lending itself to a popover batter. Petrie, insistent upon being employed every two weeks when he is fed (a diet of sugar, flour and water with an occasional splash of vinegar), was more than ready for the job And King Arthur Flour, ever the encouraging force behind sourdough starter use — among other scratch-baking inspiration — provided a recipe. 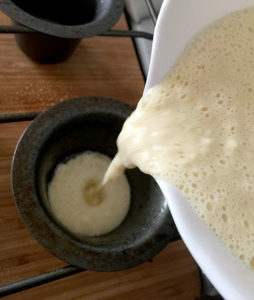 Like every popover batter recipe I’d seen, this one, too, was so very simple and whipped up in mere moments (why oh why had I not been making more popovers), mixing milk, beaten eggs, salt, sourdough starter and flour. Then, pouring this batter into a hot pan, it’s placed in a high-temp oven for about 15 minutes; then a lower temp for another 15 minutes. This batch of popovers looked slightly different than others I had experienced, raising more straight up in the pan with flat tops, like little soufflés, versus the twisted, crowned explosions of other versions. Tearing one open (they truly demand to be eaten steaming hot), the inside showed a marked difference from other popovers as well. Whereas a traditional popover is thin and hollow, these were fuller and denser, filled with a soft, rich egg-y center. Crispy light on the outside side and melt-in-your mouth on the inside, eaten piping hot and steaming. They were delicious, so moist and slightly tangy, soaked with melting butter and little jam, although I considered lowering the amount of salt (3/4 teaspoon), the next time I made them. In a subsequent baking, I tried a few changes, adding a little bit of sugar, less salt and sifting the flour into the batter. This batch came out with more elevated tops, and I felt they were more flavorful with the reduced salt and added sugar. For a long time, Petrie and I made many, many waffles. 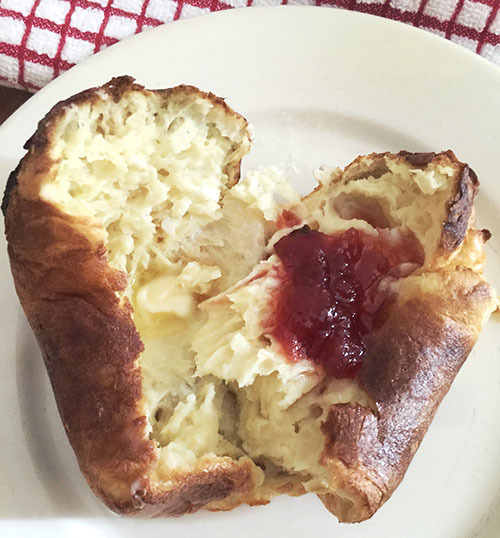 Our thing now is…popovers. We have not yet tired of them, and I, lapping them up at each baking session, see no reason why we would anytime soon. slightly warm to the touch. Heat a muffin or popover pan in the oven while it’s preheating to 450°F. non-stick pan spray, or brush it generously with oil or melted butter. leaves more room for expansion. brown. 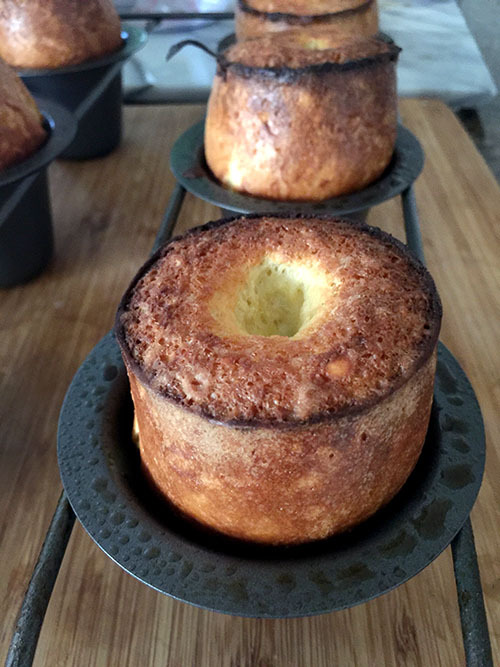 Remove the popovers from the oven and serve immediately. 1/2 teaspoon in this recipe.